Club Penguin Cheats by Mimo777 Club Penguin Cheats by Mimo777: Herbert Sends Protobot's Location! Do you know how to use defense cannons? If so, you better get out there and find Protobot! Mimo I think Herbert is talking about system defender. When is there gonna be a new System Defender level? I am guessing a new system defender out this week then... to fill in the time between parties. Yeah, same here. I mean, where else can you find cannons in Club Penguin? You know how that there is a Herbert level in System Defender? Well, that's how he knew the cannons. AWESOME!! I bet this means a new system defender level!! MIMO! There's a newspaper glitch! It doesn't close! system defender is the some-what anti-virus program for the epf's mainframe computers. i think a defense cannon inside a computer wouldn't destroy a whole robot. the protobot doesn't appear to be wearing glasses. @mimo777 Is protobot's coordinations available currently, or is that yet to come very soon? mimo I dont get it. How did he locate the location?? We have cannons? I thought we just whacked him with a giant stick. 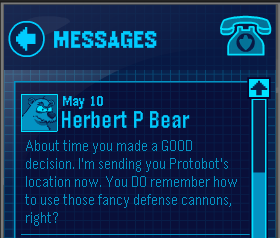 Did you remember when Herbert joins the Probot's side? Well, after he retreated, he still remembered the place where the Probot's location.